Warehouses can be very dangerous places, particularly when people are using large equipment or are working in an environment that requires lots of stock management. Warehouse prohibition signs are essential for ensuring that staff remain aware of risks in the workplace, in order to stay as safe as possible. Prohibition signs for warehouses help staff to follow health and safety regulations, and are clear with the appropriate imagery. The familiar pictogram of a red circle with the line running through it ensures that people know that a particular activity is not permitted in that area. Signs will be easily fixed in place, thanks to our range of sign fixings available. For some workers - particularly those who are inexperienced or are more inclined to take a risk - it may be tempting to climb the racking to reach the items they need, but with clear signage you can get the message across, and providing adequate steps and stools in the workplace will mean that items remain within safe reach at all times. The ‘It is strictly forbidden to climb on the racking’ sign should be placed on every section of racking where possible, so that there is no doubt about the restrictions. In some areas of the warehouse the use of forklift trucks may not be appropriate; however, without sufficient signage present, a member of staff might attempt to take the truck into that area. It could be that it is a space for picking and packing small items, so staff are walking around there freely. You can also place the ‘No forklift trucks’ sign can be placed at an entrance to remind the driver that it is a no-go area. Use floor markers and signs to further delineate where it is appropriate for employees and machinery to be operating. The forklift truck is a very dangerous piece of machinery and sometimes employees need to be reminded they should not be using it. Even if a worker knows how to drive it, without the appropriate training and license they are not insured to do so; if an accident occurs then it could cause many problems for both them and their employers. Place an ‘Operating this forklift without authorisation or training is strictly prohibited’ sign on the forklift truck and it is an instant reminder that only authorised employees are permitted to drive it. 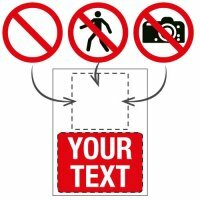 This essential health and safety sign is available with a self-adhesive backing which you can apply in seconds. You can also opt for a ‘No forklift truck’ sign that can be applied to the floor. These larger signs can be placed in the middle of a walkway so there is no doubt the truck should not be entering that section. When used alongside some of the other forklift truck signs, it is a clear indication that nobody should be taking the truck in that direction. This is one of the more important health and safety signs needed in a large warehouse and will prove an essential safety addition. We also supply a range of general warehouse signs that covers a variety of eventualities as well as other safety signs. Custom signs are a great option when you need a notice to be a little more specific or if you cannot find the exact wording you want. It could be that you want to prevent a certain piece of equipment from being used near other machinery, if this is something that is specific to your industry it is hard to find exactly what you need. Custom design your own sign and you can choose for it to be produced in a range of sizes and on a range of materials, ensuring that you can still keep your workplace as safe as possible.